Nurserywoman Carol Armatis and I had very different reactions to our first encounters with quince, the yellow, apple-y, pear-shaped fruit that, according to the 2018 Fedco Trees annual catalog for spring plantings, used to grow on trees in nearly every dooryard in Maine. Armatis, owner of 3B Apiary in Newport, plucked a perfectly ripe quince from a tree about 10 years ago and fell in love with its sweet, floral scent. I got smacked in the back of the head with a half-rotten one thrown by a brother when I was about 10. I, too, fell hard. GREEN PLATE SPECIAL columnist Christine Burns Rudalevige shares her tips and tricks to make your meals both delicious and sustainable. Rudalevige will talk about her new, award-winning cookbook, “Green Plate Special: Sustainable and Delicious Recipes,” and teach attendees to tweak their own favorite recipes to be greener. Her quince came from a lovingly tended tree, grown in an Oregon orchard, the grower fully intending for the fruit to be eaten. (It was a variety that could be eaten raw, a sort you’re unlikely to run across in the American grocery stores.) Mine dropped from a neglected old tree, surviving without human help on a steep slope behind the garage of my childhood home in western Massachusetts, a climate too cold to permit the sour fruit to be eaten unless it was cooked. My grandmother would take a few bags home to make quince jelly for her cronies who remembered it fondly. But most of the fruit landed on the ground. There it degraded into organic ammunition for girls versus boys backyard battles. They were solid enough to fly the distance but soft enough to hit the target with a satisfying splat. Rudalevige places the pears onto the quince jam. Quince have been cultivated for millennia around the world. Ancient Greeks presented the “golden apple” to brides on their wedding day, and they are still coveted for pastries, cordials, jams, and stews throughout Europe and the Middle East. But quince was eradicated from the retail realm in New England since the homogenization of fresh fruit available in grocery stores took root in the 1970s. I’d tasted membrillo, quince boiled down to a semi-solid paste, alongside salty Manchego cheese, in the Spanish tradition. But it wasn’t until 2012 when my own young family spent a fall semester in Lyon, France, that I could look at the whole fruit through a culinary lens. 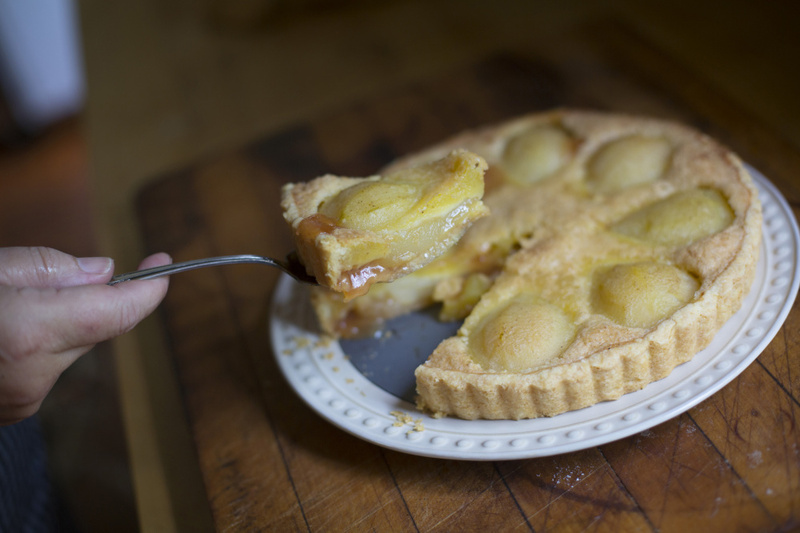 A pear and quince tart in a patisserie display case did the trick. 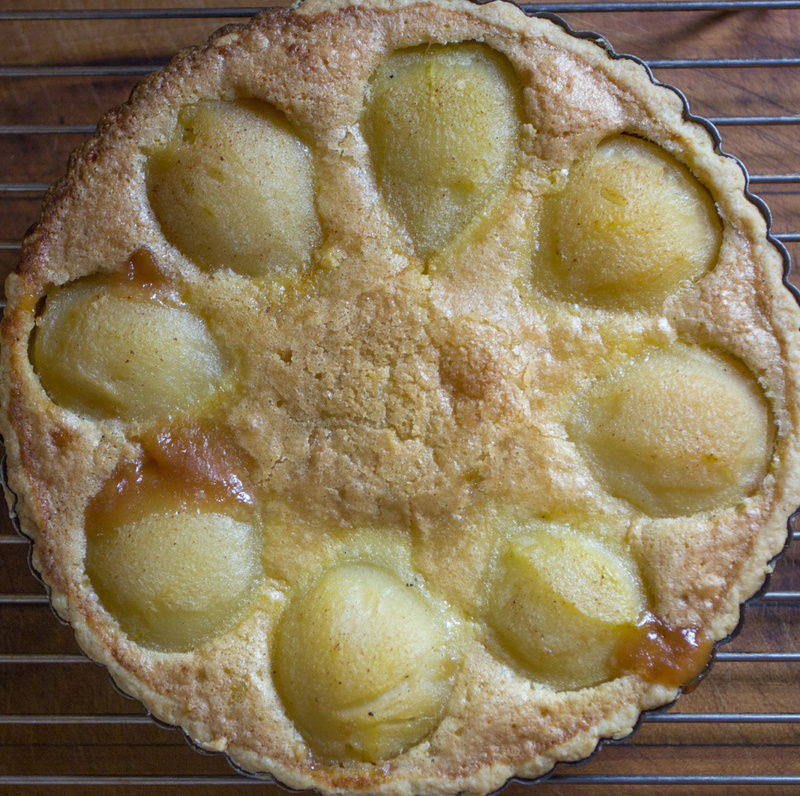 Peeled, poached pear and quince halves were arranged in concentric circles inside a flaky crust. The poached pears stayed a neutral color. But the quince were rosy pink, a function of the astringent fruit’s colorless tannins transforming into colorful pigments called anthocyanins as the flesh poached. Sweet, browned-butter custard filled in the gaps around the picture perfect beauties. It tasted as good as it looked. On a return trip to Lyon last December, walking through a market, I remarked to a friend how few quince were available in Maine as we passed basketsful on vendors’ tables. She bought some, made preserves by cooking the peeled fruit with honey and water to a fine puree, and sent me home with a stash so I could spread it across a tart crust to make a close cousin of the tart I’d tasted years before. Armatis, because she wanted to relive her Oregon quince experience, hunted for commercial quince growers in Maine. She found none. Quince trees survive in Maine mostly as backyard remnants, Jen Ries of Fedco Trees explains. The trees are susceptible to pine tree blister, fireblight and apple borers in these parts. Fighting off those issues, coupled with a non-existent commercial market, made quince a hard sell to grow in quantities here. Four years ago, Armatis started trialing several varieties of trees (not the ornamental bushes that produce smaller, more sour fruits) of her own. The most successful variety – the Cydonia oblonga Aromatnaya, a hardy Russian cultivar bred for its disease resistance – she now grows both for both its fruit that ripen in mid-October and scions which Fedco Trees grafts onto rootstock to sell to other quince lovers. In its 2018 catalog of spring planting options, Fedco is selling Smyrna (brought to this country from Turkey) and Pineapple (one said to be good for eating fresh) varieties of quince trees. Armatis has a friend who makes a citrusy, fragrant, orangy-red jelly from the fruits of her labor that she spreads on toast with cream cheese. Quince is high in pectin so it sets a jelly really well. This year’s crop is late due to unseasonably hot weather in September, and the fruit size smaller due to the abnormally dry summer weather, but she’s still planning on getting a bit of that jelly once the quince ripen from green to golden and lose their downy fuzz, a telltale sign they are ready to pick. Armatis is hopeful that quince will make comeback in Maine and help restore this bygone measure of biodiversity across the state. But that will take orchardists and home gardeners caring for old trees and planting new ones that produce the fruit. And it will require home cooks tapping old recipes (perhaps Fanny Farmer’s Honeyed Quince and Quince Ice Cream) and creating new ones (like the cocktails made with quince-infused tequila that are served at Enoteca Athena in Brunswick) that include them. Every plate filled with quince treats served is a step in the right direction. Start with this tart. You can get quince into this tart in one of two ways: If you’ve scored some fresh whole quince, you can use half poached pears and half poached quince. Otherwise, use quince preserves or jelly combined with poached pears. As this year’s crop is late, I ran with the preserves option for the tart in this photo. You’ll need a 9 or 10-inch tart pan with a removable bottom. To make the poached fruit, bring 4 cups of water and the honey to a boil over medium heat in a Dutch oven. Stir to dissolve the honey. Add the pears (and quince if using), split vanilla bean and lemon juice. Return the mixture to a boil and immediately reduce the heat to a simmer. Place a small ovenproof plate into the pan to keep the fruit submerged. Cover and simmer the fruit until it is tender, about 30-60 minutes depending on the ripeness of the fruit. Cool the poached fruit in the syrup and refrigerate until you prepare the tart. To make the pastry, combine the dry ingredients in the bowl of a food processor fitted with the steel blade. Pulse several times to mix. Add the butter and pulse 3-4 times until the butter is in pea-size pieces. Add the ice water and pulse 2-3 times, until the dough forms clumps, but not a ball. Dump dough onto a floured work surface and shape it into a disk, wrap it tightly, and refrigerate for at least 1 hour. When you are ready to prepare the tart, set a rack in the lowest level of the oven and preheat to 375 degrees F.
Remove the dough from the refrigerator and place it on a floured work surface. Tap it with a rolling pin to soften it. Roll it out to an 11-inch disk and transfer it to the tart pan, pressing it into the bottom and up the sides of the pan. Cut off any dough hanging over the rim of the pan. Chill the crust while preparing the filling. Remove the poached fruit halves from the syrup with a slotted spoon and place them on a clean towel to drain. Pour the flavored syrup into a clean jar and save in the refrigerator for up to 2 weeks for another purpose. If you are using quince jelly or jam, spread it over the bottom of the chilled crust. To make the filling, melt the butter in a small saucepan over medium heat. Cook until the butter begins to become foamy and turns a light brown color, 2-3 minutes. Do not walk away, as it can burn easily. Pour the butter into a heatproof bowl to cool slightly. Whisk the eggs and sugar in a large measuring cup. Whisk in the flour and then slightly cooled brown butter. Arrange the poached fruit, cut side down on top of the pastry or the quince jam, if using. They should fit closely together with the rounded ends perpendicular to the edge of the crust and the stem end toward the middle. You should be able to fit 8 halves. Pour the brown butter filling into the center of the pears and allow it to flow around them. 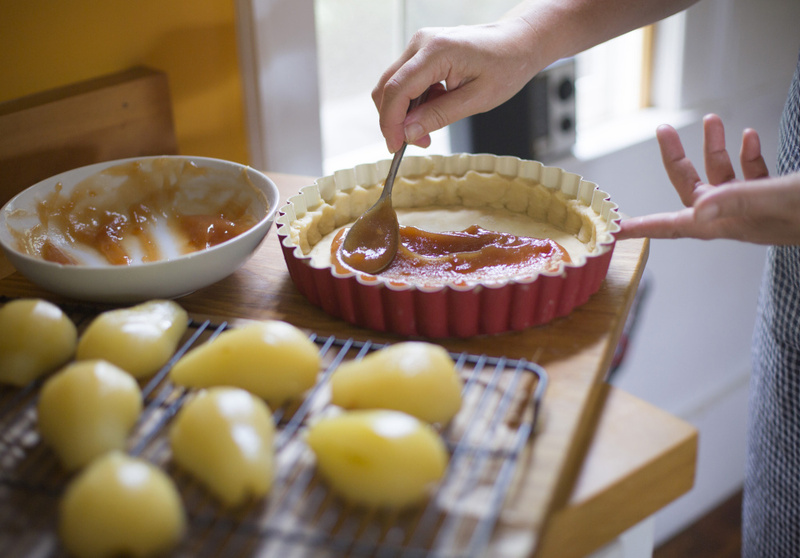 Bake the tart until the pastry is baked through and the filling is puffed and slightly browned, about 45 minutes. Remove the tart from the oven and cool it on a rack. The filling will fall as the tart cools. To serve the tart, remove the side of the pan and slide the tart from the metal base of the pan to a platter. 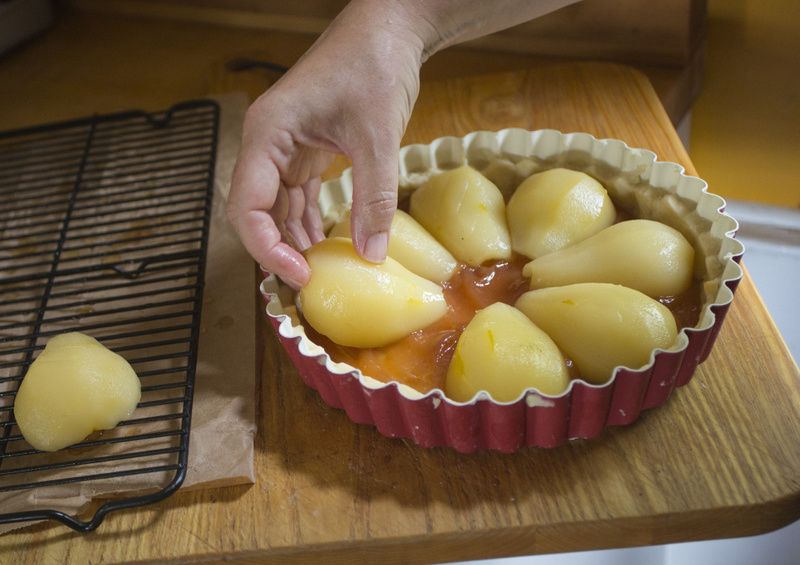 Serve the tart at room temperature, cut into wedges.